The race cards are the theater programs in the world of horse racing; it is the guide that contains the information about racecourse and the races of the day. This will keep you in check of all the fun and excitement of the day as far as horse racing is concerned. You can buy them at a low price and enjoy the whole race day. Horse racing contains lots of statistics and information. This can be overwhelming for some people, but it is what makes the game so compelling for thousands of people worldwide. On the horse racing racecards today, Cartmel was at the helm of it with a number of exciting races. The racing surface was good to soft with the weather bright and cloudy. These are ideal conditions for a good race day. 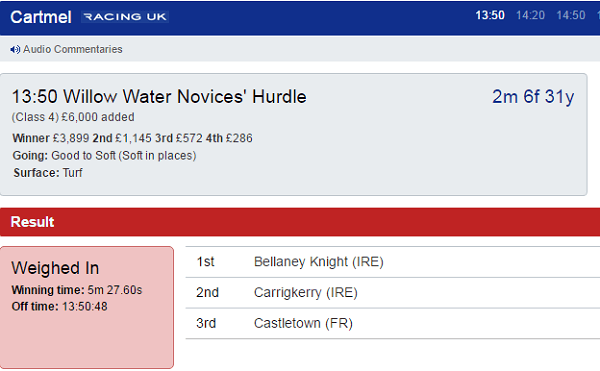 The first race was the Willow Water Novices Hurdle which was as intriguing as expected. Bellaney Knight carried the day in this race after tracking the leaders from the eighth place before going second and staying on well to finish first. The trainer John Quinn and the owner Rosbotham were both impressed by the stunning performance though it was not expected. Carrigkerry finished second after pressing the leader, took the lead for a while but was outridden to almost last but had the persistence to push for second place. Mrs. Fuller was smiling at the end of the race though the horse was a favorite for the race. Castletown led, but a small mistake cost him the race as he struggled to finish third. Work Du Breteau had taken a hold early but seemed weakened towards the end and managed a fourth place finish. Reed, the trainer, was not impressed by this finish and promised a better run next time. Sun Odyssey was outpaced right from the start and finished at fifth. Mafate Fortin, Jennifer Anne, and the Lonely soldier took the sixth, seventh and eighth positions. The punters lost a considerable amount of money as these were not the most expected results. The Racing UK Day Pass Handicap Chase was similarly exciting. Endeavor day carried the day with an outstanding performance being held up at the back early in the race before finding his footing and leading at the last bend before the straight and cementing the lead for a top finish. He was followed by Reverse the Charge who took hold of the race but was beaten at the bend and had no hopes of catching Endeavor. Lord of Drums was third placed; the horse was outpaced halfway and had to rally behind the leaders, but they were unstoppable this time. Pekanheim was outpaced and only managed a fourth-placed finish beating Carters Rest and Sacre Malta closely. Formidableopponent and Mutyrs Delight struggled through the race and were 7th and 8th respectively. 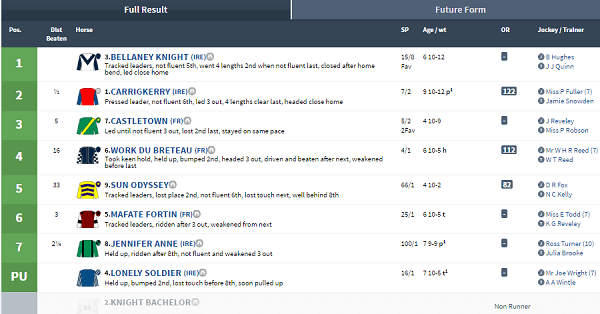 The another highlight of the horse racing racecards for today was the Champagne Louis Roederer Handicap Chase. Western Home was the winner here. He was held up in touch, and a steady come back to track the leaders, took the lead, looked a bit shaken up while going into the straight but managed to secure the win at a time of five minutes nineteen seconds. 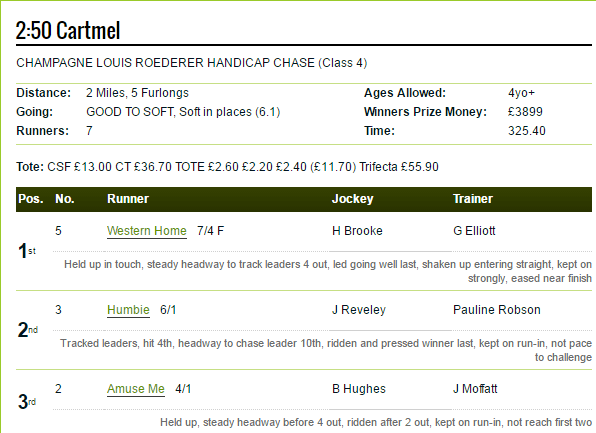 The race was well contested with Western Home only managing to beat Humble and Amuse Me by a length short. Raymond Burroughs attested to the competitiveness of the race and said that his horse was lucky to win the race. The rest of the horses such as Up and Go and Dun Faw Good were promising earlier on in the race and seemed to be possible winners before the race took its shape. They managed a fourth and fifth placed finish. Curragh was another interesting racecourse of the day. The horse racing racecards today offered one of the best showdowns of the sport. The racing surface was good to yielding in some places which were conducive for an awesome day of sports. One of the major highlights of the Curragh horse racing racecards for today was the Chapman’s Mitsubishi Kildare Fillies Maiden. 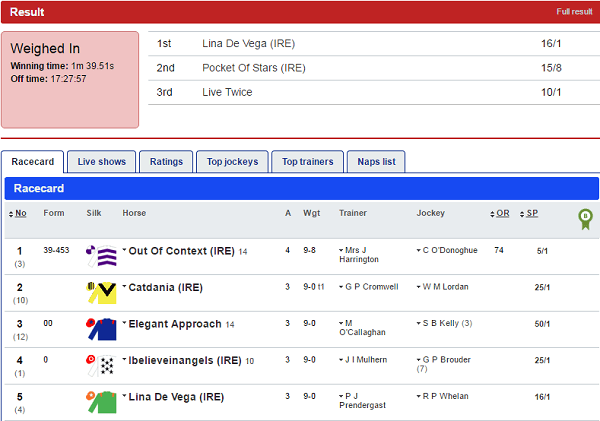 The three-year-olds put up an impressive performance, and Lina De Vega emerged the winner. The horse led in the final 150 yards and was able to maintain the lead going clear in the final stages to clinch the win. The trainer Prendergast as well as the owner Ballylinch Stud were delighted by this win and were predicting bigger wins in the future. Surprisingly and Out of Context were the horses behind the leader. Newton Abbot was simply amazing today. The ground was good to firm with the weather light cloudy coupled with sunny spells. The horse racing racecards of the day did not deny us a full treat of horse racing thrills. The Sis Stream Juvenile Hurdle was the highlight here which was quite competitive. The punters lost their money here, but that is part of playing the gamble. Hygrove Percy was the victor here with odds of 5/1. He was at the last position for a considerable amount of time before picking up and outpacing the rest to win this race. Neil Mulholland was not one of the most surprised individuals although neither the punters nor the reviewers had predicted this turn of events. The invocation was second. He chased the leaders for the better part of the race and made a mistake which left him for last but was able to pick up and give Hygrove Percy a run for the money. Schoolboy Error was closely behind the leaders though he was a favorite for the race. He was outpaced by the two by making slight errors towards the ends that left him chasing the race. Stone Quercus was expected to be a title contender but the day was not a good day for him as he slipped to the fifth position. The horse racing racecards of this day gave us a thrilling sports day, and we are definitely looking forward to the next race day.